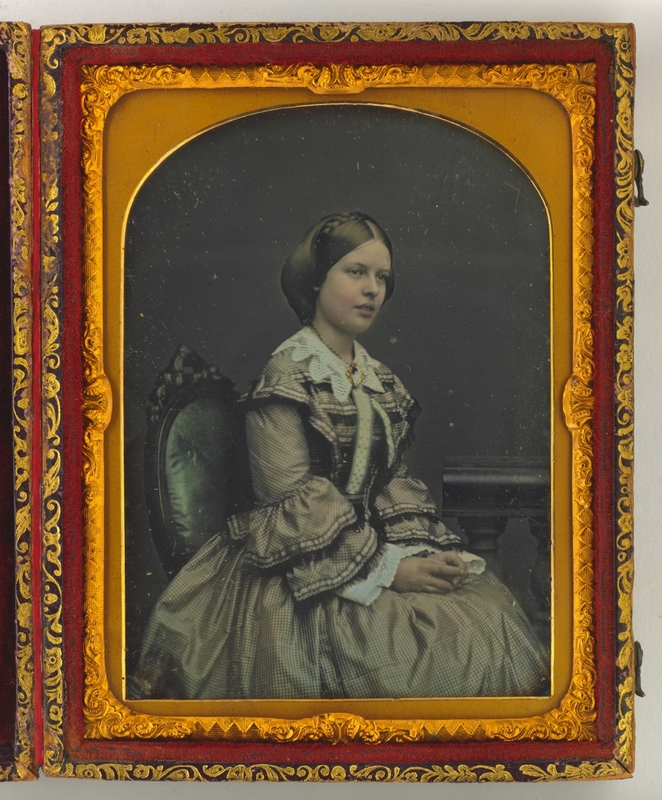 This right facing ¾ seated portrait shows Eleanor Elizabeth Stephen, aged about 15, dressed to receive guests making social calls for an ‘At Home’ visit. The subject has been posed on a soft-buttoned drawing room chair set against a plain backdrop with a section of turned wooden balustrading, studio furnishings which confirm that this portrait was taken on the premises of society photographer Edwin Dalton, located at 243 George Street (opp. Bridge St). It may be that Eleanor’s trip to the photographer coincided with an important rite of passage in her life; until the mid-20th century teenage girls wore their hair loose until formally entering society on reaching marriageable age, at which time they assumed fashions of greater sophistication including elaborate adult hairstyles. Eleanor’s mother, Lady Stephen recorded this visit to the Dalton studio in her diary on 11 July 1854: ‘We, that is, Jessy, Nelly [Eleanor] and I went to have likenesses taken by the Daguerreotype process.’ Unhappy with the original result, however, Nelly returned for another sitting two days later. Ten days after that, Lady Stephen noted that the family’s photographs were ‘always done by Dalton who is the best and most expensive photographer’. (MLMSS 777/3) Nelly wears an afternoon dress of checked silk printed à disposition (ie. produced with co-ordinating border designs of differing widths intended for decorative use as flounces on skirts, sleeves, bodices). Her dress has a bell-shaped double skirt with a flounce at the knee – the edges are just visible at the base of the image on the left. The bodice is made separately in the ‘basque’ style, with a small peplum extending over the hips below the waist, and stomacher or ‘plastron’ (v-shaped) corsage trimmed with a pair of flat panels, tabbed and forming epaulettes at the shoulder, diminishing to a point at the waist either side of five horizontal rows of applied fringe arranged ‘en eschelle’ (in the form of a ladder) worn with a white-work collar, edged with [needle-lace] Vandyke points, over a brocade ribbon crossed at the throat and fastened with a [cameo] brooch above loose streamers. Her ¾ length ‘pagoda’ sleeves are trimmed with two tiers of stepped flounces, finished in the same manner as the bodice, and worn with open undersleeves, or ‘engageants’, of white-work (broderie anglaise) embroidered cotton. Her mid-brown hair is centre-parted with smooth front sections drawn over her ears and pinned behind, a plaited section wrapped around the crown of her head, and the remainder arranged behind in a large, deep roll. She also wears a string of beads around her neck. Alfred Stephen, barrister, married Virginia Consett in 1824 and migrated to Van Diemen’s Land from England the following year. Initially appointed as Solicitor-General and soon after Crown Solicitor by Governor Arthur, Stephen’s career included his appointment as Attorney-General (1832), Chief Justice (1845), and member of the Legislative Assembly whilst still maintaining a private legal practice. After his first wife’s death in 1837 (leaving two daughters and five sons), Stephen married Eleanor Martha Bedford, the only daughter of Reverend William Bedford in 1838. Eleanor and Alfred Stephen had five daughters and four sons of whom Eleanor Elizabeth (1839-1861) was the eldest. Five years after the making of this portrait, Eleanor died suddenly of suspected typhoid fever, aged 20, on 7 February 1861. (See: Riley, M, Pictures Wanting Life, forthcoming) PHOTOGRAPHER: Painter, photographer and lithographer, Edwin Dalton had spent some time in America before coming to Australia in the 1853, possibly in search of gold. Initially setting up as portraitist in Melbourne, by early 1854 he was living in Upper Hawthorn (Vic.). In July 1854, Dalton was in Sydney where he soon attracted commissions from the city’s most prominent families. In March 1855 the Illustrated Sydney News favourably reviewed Dalton’s life-size portraits of Sydney identities including J.S. Dowling (‘so life-like that it is almost laughable’), Walter Lamb, Henry Parkes and numerous others. In August 1856 the Empire noted his recently completed portrait of the prima donna Anna Bishop, claiming that ‘for fidelity of portraiture, depth of tone and beauty of colouring, the picture ranks with any work, in its particular line of art, we have yet seen in the colony’. He advertised ‘Dalton’s Collodion Portraits’ at 243 George Street (1855-57) and his studio, known as the Royal Photographic Portrait Establishment Gallery with William Bradley as proprietor, at 400 George Street (1858-59), followed by the Royal Photographic Gallery at 320 George (1863-65) and at 330 George Street (1866-67) which was later taken over by H. Hunt, as proprietor. ETIQUETTE: The making of social calls was an important ritual during the Victorian era. Specific times were allocated for different types of calls with Sundays always reserved for friends and family only. Visits were always quite short, lasting from ten to thirty minutes. A ‘morning call’ was paradoxically made in the early afternoon, with ‘ceremonial calls’ made between three and four o’clock, and ‘semi-ceremonial calls’ between four and five o’clock. Calls made between five and six o’clock were deemed ‘intimate calls’. If another caller arrived during a visit, the first caller was expected to leave within a few minutes of the appearance of the second. Dress for calling: Ladies who were ‘At Home’ to callers were supposed to wear tasteful clothing ‘with a certain amount of lace and jewellery’ but no artificial flowers or glittering gems; callers should wear the sort of clothing they would wear to church or an afternoon reception; a gentleman wears a ‘morning’ suit until six o’clock (ie. grey, striped trousers, black vest and coat, bowler or top hat) and evening attire after six (ie. a black dress suit). Dalton, Edwin (fl. 1853-1865) attrib.